I'm still having a smoothie and popcorn for breakfast most mornings, and I've also been buying Welch's Grape Juice lately too. When I ran out of orange juice concentrate the other day for my normal smoothie, I subbed some grape juice. It made the whole thing taste like grape juice to me--which is a GREAT thing. Ever since I was a small kid, I've adored grape juice, but it was a rare treat for us. I usually only got it on field trip days. It came in these tiny cans with a foil tab top, and I think I remember that juice more than I remember the actual field trips. More evidence of me being a foodie from the beginning. Then there was the occasional communion grape juice. That's it. Grape juice was a magical (and apparently expensive) treat. 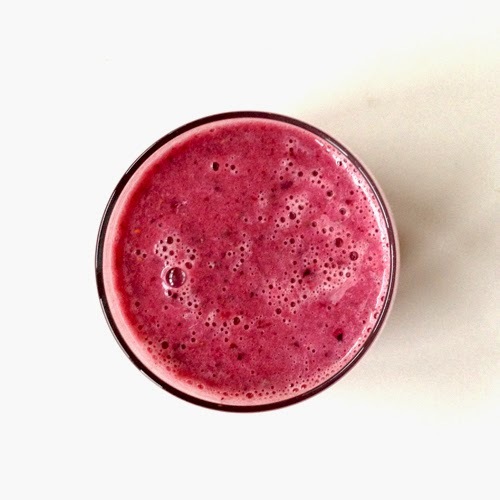 Lately I've been enjoying it in my smoothie every morning, and it still tastes special. If you're a grape juice fan, try this out. I think you'll love it as much as I do. In a tall plastic cup, place all of the ingredients in the order listed. Fill with enough water to just cover the top of the fruit. You can always add more water to thin it out later. With your immersion blender in hand (I use my Braun Hand Blender), push down into the cup as far as you can and then start the blender. Blend gently with up and down motions, pushing down on the frozen fruit to break it up. After you've gotten the blender to the bottom, keep blending for another 30 seconds or so, moving the blender up and down until you have a smoothie texture. Add more water & blend if the smoothie seems to thick. Pour into a glass with a straw and enjoy!